Our Mexico program was completely revamped when Popocatepetl became active years ago and the trip is now better than ever. After the awakening of Popocatepetl, IMG set our sights on another nearby volcano: Ixtaccihuatl (17,338'). Orizaba and Ixtaccihuatl make for an action-packed week with two climbs! It's amazing how much you can pack into a nine-day period with a well-planned itinerary. Ixtaccihuatl (17,338') provides a nice exposure to the Mexican countryside and a great opportunity to acclimate. Our route of choice will be either the Arista del Sol or the Ayoloco Glacier. Orizaba (18,491') will be climbed via the Jamapa Glacier. In addition to the climbs, two nights are spent in Mexico City and one in the old Spanish colonial city of Puebla. We'll spend the night after climbing Orizaba with friends of ours in the country town of Tlachichuca. Each of the climbs involves several thousand vertical feet of snow and glacier climbing. 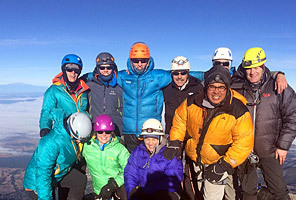 This nine-day trip to Mexico is great as a first high-altitude experience or as an excellent way to prepare for Denali. Basic climbing experience, such as a climb of Mt. Rainier, would be excellent training for the trip. Each team member needs to be familiar with ice axe arrest, basic cramponing and rope team travel. Each climber also needs to be in excellent physical condition; climbing to altitudes approaching 19,000 feet is never easy. We have conducted these trips since 1976 and they have always been a favorite. It would be difficult to find a guide service with more experience climbing in Mexico. This trip only requires you to break away from work for one week. In just one week you can sharpen or acquire new skills while enjoying some Mexican sunshine and see another area of the world. We sincerely feel that this is one of the best run Mexico Volcanoes programs available. Experience, leadership and relationships make the difference in our programs.